This Bible coloring page is based on Psalm 145:9 and teaches about the goodness of God to all people. Click on the preview above to download as a print-friendly PDF document. Advanced users can also download the JPEG image and edit on their own in Photoshop. The illustration shows a line people holding signs: the young, the elderly, girls, boys, the rich, those in need. If you enjoy this free printable, please leave a comment below and share how you will use it in your ministry. Many of other readers have found these coloring sheets helpful in their Sunday School class or even at home with their own family devotions. This is just one of many Bible verse coloring pages posted on our website. 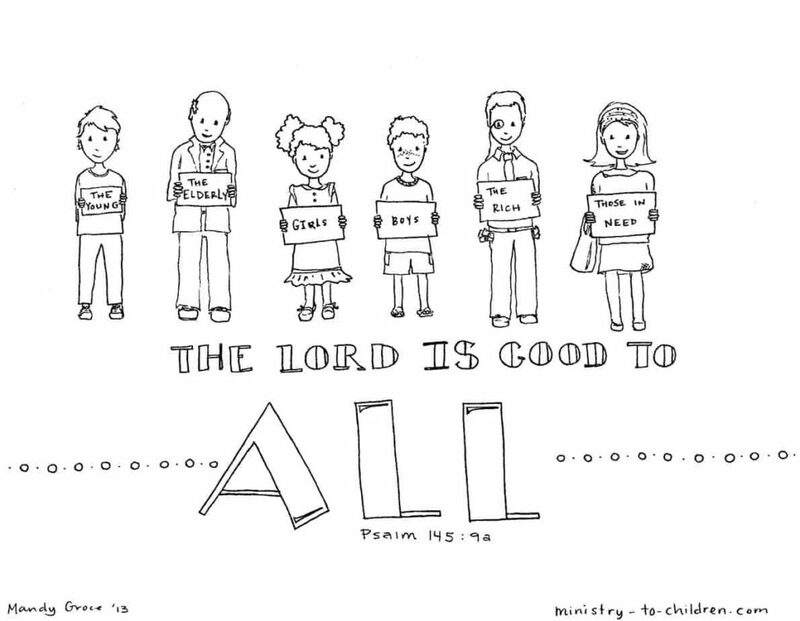 A friend of mine and I are working on a family Bible study on the Fruit of the Spirit and we’d like to use this coloring page on the goodness of God in the chapter on Goodness. I wanted to check to be sure it is free to be used in such a way before doing so. I would include your website for credit next to the coloring picture if you allow us to use it. Thank you for kindly considering this. This sounds wonderful. Please use the artwork with our blessings! Tony Kummer (Editor) reviewed & updated this page on : April 17, 2013 at 9:01 am. All our content is peer reviewed by our readers, simply leave a comment on any post suggest an update.